The decision of whether to use a cover song on your demo depends in part on what your goal for the demo is: to demonstrate your vocal skills as a working singer or your playing abilities or to present yourself as an artist. What's Your Goal for the Demo? If the aim is to show off your vocal abilities or playing abilities—say to audition for a role as a session musician or backup singer—then a cover song is perfectly acceptable. A wide variety of styles in your covers will show your flexibility. Further, if there is a cover song that is particularly associated with you or your group, such as one your fans always shout for at your shows, then you have a better argument for including a cover on your demo. If you're looking to present yourself as an original artist, then your demo should reflect your style—preferably through original songs of your own. Your music demo is supposed to be just that—a demonstration of your music. 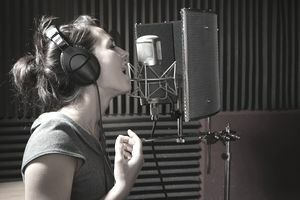 Demos are used for attracting attention from record labels, promoters, managers, agents, and other industry types, and what all of these people want from a demo is a clear understanding of what kind of music you make, what unique ideas you have, and whether or not you have a sound that it is identifiable as your own. Your demo should focus on what makes you unique as an artist, so a consistent style will serve you well; a broad range of material and cover songs are not your best option for a demo. Using a cover song shortchanges you because it stops you from showing off all of your abilities. Remember that your time to capture someone's attention with a demo is very short. If there was ever a time to come with your A-game, it's this. At the end of the day, including a cover song on your demo is not an absolute no-no. If you're planning to include a cover on your album, or as previously stated, there is already a cover song associated with you, then you can get away with it. As a rule, however, limit yourself to one, and don't ever just ape the original version. You'll enter karaoke territory, and that will be the kiss of death for your demo. Recording and mixing your demo. If you already have your demo recorded, you can find tips on getting your demo out there and into the hands of the people who can help you take it to the next level. Mixing and Mastering: What Are They in Recording? How Can I Join BMI or ASCAP?